Kind of hard to tell, isn't it? It pretty well references just about the entire line of superhero comics Marvel was publishing back then without focusing on any one in particular. Prior to this, it wasn't a given that comics ran letters pages. 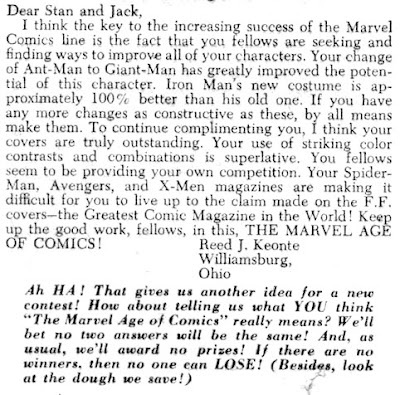 Lee has noted in the past that he was taken a little by surprise that their superhero books generated fan mail, as prior Marvel comics didn't. But the volume grew quickly -- Lee noted in FF #13 that they received "hundreds" of letters every month, presumably across their whole line. One year later, and they were getting enough mail to have a letters page Sgt. Fury! I point this out to say that, while mail was an integral part of the interaction between fans and comic creators, as well as among fans themselves, it was a new phenomenon once upon a time. It grew quickly because it was the first real communication a lot of people had with creators and other fans, and that Lee thought enough to help facilitate that in the letters pages speaks to where his talents in promotion lay.